I worked as a newspaper trainee sub-ed for a short while in Kolkata after I had finished college. The one part that I would look forward to the most at work was to conjure headlines with whacky puns. At times our bosses had to calm us down and say that the reader should at least be able to figure out what the article was about from the headline! I picked up where I had left off at the sub-ed desk when I began blogging years later. I tried to get quirky and creative with the headlines of my posts. I would pun, use esoteric references, not really bother about whether people would get what the piece was about. I was happy as long as I got to be clever. Recently, during a meeting, a former mass media journalist and editor, now living the social media content writing life, wryly said "today we all write for Google, don't we?" As I began to write for sites other than my blog, I got to see the click-bait focus of editors that I worked with especially when it came to headlines. Nothing wrong with that. It is their job to drive readership. It is just that I had never thought of headlines that way. I have used these experiences to learn and grow, and use for my blog as appropriate. The heading for the this post is an example of this. Now that I have drawn your attention, let me assure you that the post is indeed about the best biryani experience that I have had in Kolkata. However, it is not a discussion about the relative merits of a Royal versus Arsalan. Nor is it about whether the biryani of Kolkata is a biryani at all in the first place. Or how the blessed potato got an entry into the biryanis of Kolkata. We will definitely not evoke the name of good old Wajid Ali Shah here. 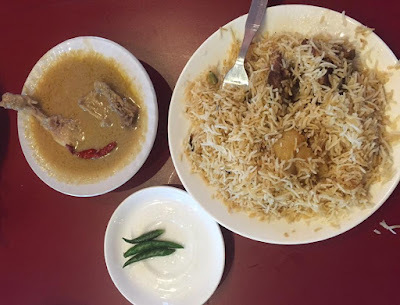 Let me tell you instead why the biryani that I recently had at the suburban branch of the fairly old central Calcutta Mughlai restaurant, Aminia, was so special. The story goes back to a couple of weeks back when K and I had gone to Kolkata for a couple of days. It was primarily a personal trip. The idea was to spend time with my mother and my grandmother. To avoid inconveniencing them, we stayed in two hotels over two days. Both, and most big hotels in Kolkata, were located far from where we stay. 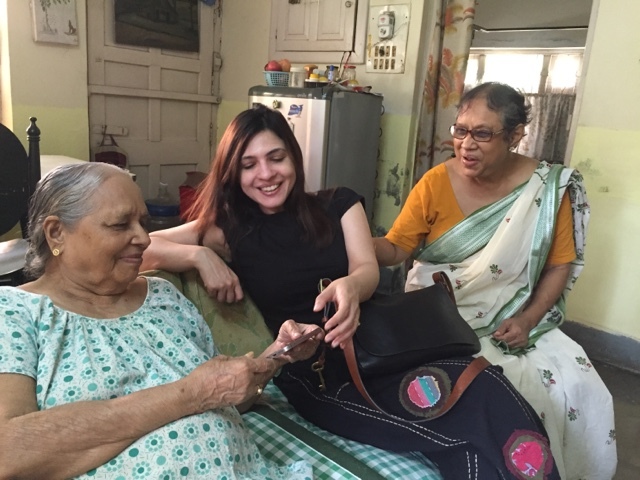 Our two days in Calcutta were spent in making multiple car rides from the hotels to my granny's home. Being away, one can't really help them out much but one tried to do a little bit in the short time together - doctor visits, paper work and so on. So I landed at the Kolkata airport, checked into the first hotel and then cabbed it down to my granny's place. I said hi to her and then picked my mother and went to a nearby public sector office to get some of her financial paper work done. The experience at the office was the same from what I remembered of similar organisations (government run banks, post offices, insurance companies) from my time in Kolkata. You enter the office which typically has walls with peeling paint and a gloomy look around them. Most of the staff looks fairly elderly. You go to a counter anxiously clutching your papers to the person you need to meet. The person won't look at you or acknowledge your presence even when you stand in front of the person. You known the drill and say what you need to say, undeterred by the lack of recognition from the other side. Then wait. The person continues to look at a ledger or a decrepit computer and act busy. Then after a while, the person will turn to you with an exasperated look and mutter something. Either to chastise you or to send you to another counter. You then go to the other counter. The story gets repeated. You again stand wait hoping for eye contact. People like my mother have to go through this all the time but just ten minutes were enough to exasperate me and I moved to a corner of the office and began to Facebook. It was close to 4 pm by the time we had finished. I had thought I will drop my mother home, grab a bite at a restaurant close by and then head back to the hotel, pick K and then come back with her to meet granny and me. Suddenly my mother said, "why don't you have lunch first?" and then, "come, I will come with you." I was tired and hungry. I offered to drop her home as she would be tired too but she insisted that she would come with me and seemed to have a sudden spring in her step. When we came out of the office, my mom saw that they were selling tender coconuts at a cigarette shop downstairs. 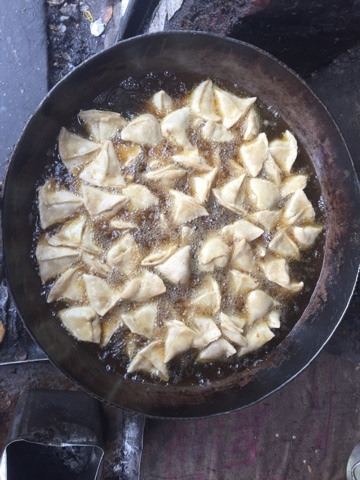 There was another guy making tea outside and a sweet shop where they were making shingaras (samosas)for the evening. Ma stopped to have some tender coconut water while I looked longingly at the samosas. 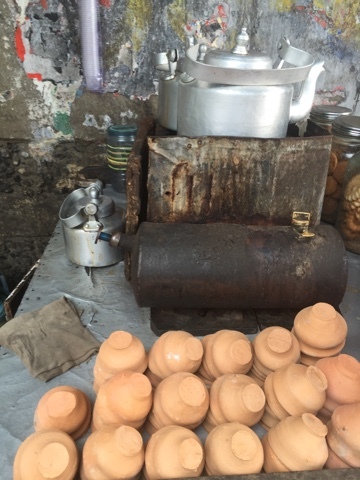 Chai on the streets of Calcutta used to be served on bhaars or earthen mugs. Freshly fried shingara. Stuffed with potatoes and crushed peanuts. Cauliflowers too in winter. We then went to a restaurant called Aminia which was close by. This branch is relatively new. It is close to our house. I had eaten there before. We entered the restaurant and they told us that lunch was still available though it was past 4 pm. Rolls were only for takeaways though and could not be had at the restaurant. Which was cool. Rolls for me are snacks. Lunch had to be biryani. We walked up the stairs to the first floor. The restaurant was air-conditioned. Not entirely empty. There were people eating lunch and chatting at that late hour. We picked a table and sat down after we were warmly welcomed in by the wait-staff. I picked up the menu and was about to order when my mother said, "this is my treat." I protested. I said I would pay. She replied, "I insist. Let me treat you. I never get a chance. I have had lunch so you order for yourself". I wanted to order a mutton biryani and a chicken rezala. I was suddenly unsure of this as my mother doesn't approve of my eating red meat and often has lectured me on the same. 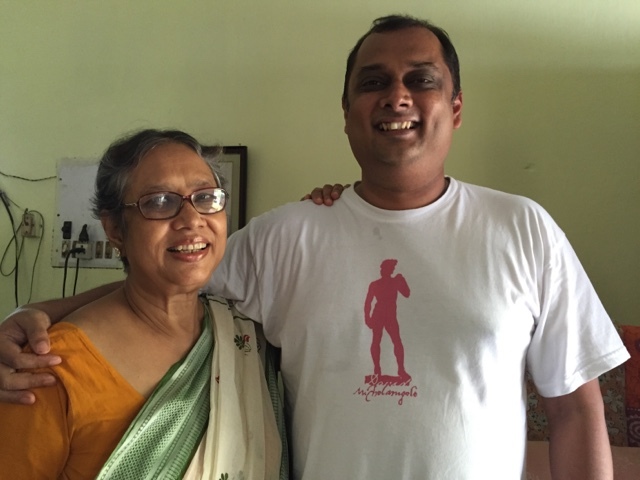 If you are a Bengali son, it doesn't matter if you are four or in your forties as far as your mother is concerned. I hesitantly did order the mutton biryani though. She didn't say anything. She didn't even give me a disapproving look. I didn't order the rezala as I planned I would at first. I didn't want her to spend too much on the meal. Then I realised that I really wanted the rezala. 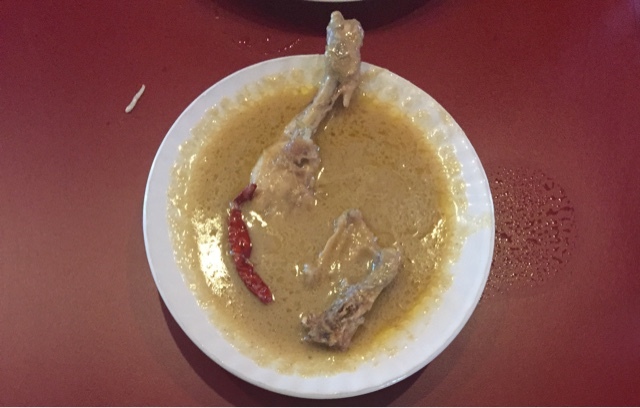 So I called the waiter back and told him, "ek chicken rezala, leg piece". And then, I suddenly remembered my last visit and told him (in Hindi), "I had come here a couple of years back. The food was lovely but the mutton in the biryani was very tough." The waiter looked at me and replied, with a serious and concerned expression, in Hindi (staff in Mughlai restaurants in Kolkata are often from north India), "some pieces do turn out be tough but let me see what I can do."" We waited for our food. This was the awkward bit. I run out of conversation pretty fast when I am with my mother. It's pretty simple. She wants to know everything that's happening in my life. And I am not keen to volunteer any information. So I wasn't sure what we'd talk about. Yet, talk we did. Mom told me about her recent experiences of living with my grandmother and how they adjust, and don't adjust, to each other. Her joy in writing her blog posts. The reactions she gets to her Facebook pages. The new friends she has made at the park. As far as I remember I didn't reply in my usual mono-syllables that afternoon. In fact I think we actually had a rare conversation. 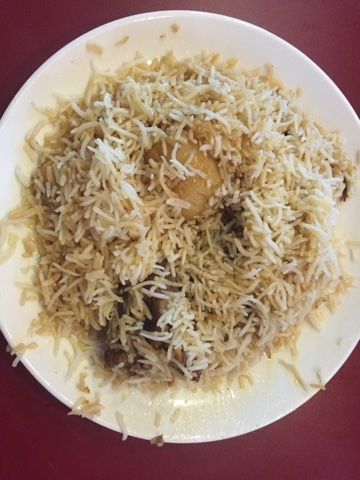 I smiled at the potato in the biryani. The rice was not yellow in colour though unlike in a lot of other biryanis in Calcutta. I asked the waiter why it was not so. He shrugged and said that he didn't know but that their biryani was never holud (yellow). He then told me that the biryani was made on site at the suburban branch though the spices and recipe came from the central Aminia branch. The rice was brilliantly flavoured but what won me over was the quality of the mutton or the goat meat. It was so tender and juicy. Probably the most memorable piece of mutton that I had eaten in a Calcutta biryani. I called out to the waiter and complimented him. He said, "I was sad that we couldn't give you a good piece of mutton last time. I really dug deep in the biryani deg (vessel) to find what I thought would be a good piece this time. I am so glad you liked it." It was as if I was a guest in his house. The rezala (a curd, ghee and grated onion based Moghlai curry) was brilliant. The sauce was silken, a lovely balance of tanginess with a touch of sweet. Seasoned perfectly. Very comforting. The chicken piece very tender. I finished off the entire bowl. I was happy. My mother is a very disciplined eater, so she didn't eat anything that we ordered except a few spoons, or 'half a spoon' as she puts it, of the rice. Just after I finished, she decided that she would have a plain roti and requested our waiter to get us a serving. My food was over by then and I was done with lunch. I had over-eaten and happily so. Our friendly waiter got us a plate. There were 2 rotis in it. My mother had one and she told me to have one. I offered to order a gravy dish for her but she said she would have the roti by itself. I took a bite of the roti and realised why. These are rotis made in a tandoor and with maida. The roti was piping hot and had so much flavour to it. A touch of salt. A bit of sweet. It was quite tasty by itself. One would normally never appreciate the beauty of the roti as one would dip it into a gravy and eat it. Having the roti by itself made me appreciate the genius that went into its making. There was a film of the rezala sauce left on the bowl. I mopped it up with my roti. 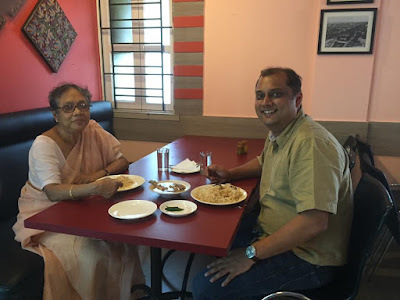 Our waiter suddenly appeared, and on his own initiative came and poured some extra rezala gravy into my bowl and offered to give some to my mother too. This was on the house. "Why have the rotis by themselves," he said. "It will be dry."" I was touched by his gesture and the overall service experience. This was a not a place that levied service charge. I was not a regular at the restaurant. Not a known face. He didn't know me as a blogger and stuff. I was not even carrying a DSLR. He was just a warm and kind man who had decided to make me feel at home in what was once my home town. I realised later I that I should have taken a photograph of him and show it to people who said that the service in Calcutta is (it used to be) sullen. Such a pleasant change from the PSU office. And for once that afternoon, I didn't behave like a sullen teenager with my mother like I usually do. And she didn't lecture me on my life either. We just sat and chatted together like we used to at Rim Jhim, a (now shut) South Indian restaurant close to my school, when I was a chubby 8 year old, with a British accent, and had just moved into to Calcutta. Now, if you have read up to here, then I hope you will agree that my headline was quite appropriate, won't you? Very nice and touching post. ...sorry got the spelling wrong, rezala! Hey nice one. Sad we couldnt meet this time as the schedules didnt match but hope for the next time. Kolkata biryani were my staple diet as a student. Recently I had the best biryani of my life at Idrish in lucknow. The mutton pieces were the softest ever. Kalyan, I am making Kolkata mutton biriyani tomorrow at home and would love to bring you over some. Let me know. The mutton will be memorable, I can guarantee. Give me a shout on 9820762269.